The distillation process: this includes extracting the oils through a gentle steaming process. The expression process: this entails pressing the oils out of the flesh, roots, and stems. The solvent extraction process: when a plant or flower is too delicate to perform steam extraction or pressing, this process is performed by using superficial carbon dioxide to extract the plant or herb oils. Is it grown without chemical pesticides? Is it grown in its natural habitat? Are the plants harvested at the height of ripeness? Are extractions performed when the plant is at its peak property production? Does the manufacturer stand behind the internal use of their oils? Are the oils being third-party tested to ensure their quality and purity? Once you have found a quality, purely sourced oil, the next step is learning how the oil is used and for which body ailments it assists in healing. There are many resources that can help you identify the right oil to use for your particular inquiry. 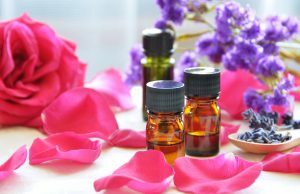 It is very important to follow the prescriptive guidelines of each oil, as very few can be taken internally and they each have their own special healing qualities. One of our favorite essential oils here at Radiance Day Spa is lavender. It has a calming effect on the nervous system, antifungal and antiseptic properties, and aids in sleep and relaxation. Whichever oil you choose, have fun exploring the many essential oil choices for your overall health and well-being. Enjoy this Lavender Compress recipe from one of our cleanly sourced, organic product partners, Naturopathica.